Before my first rehearsal as a member of the Chicago Symphony, I asked my grandfather how I’d know the exact moment to come in after Barenboim’s downbeat. I had hoped for something more illuminating from a veteran of the Philadelphia Orchestra. Even though I’d been playing professionally for two years, it was with the Saint Paul Chamber Orchestra, which was more like a large string quartet than a small symphony. I was completely unfamiliar with the giant machinery of a Philadelphia or a Chicago. As a child, I considered it mandatory to play an instrument: both my parents were professional flutists, and everyone they associated with seemed to play something as well. Since I was an only child (at least until I was six), it meant that literally every person in my experience spent their time playing instruments (and from what I could see, playing cards, drinking beers, and generally having a wonderful time). When I was four, I asked what my instrument was. At that age, there were really only two choices: piano and violin. Flute, for example, would have been out of the question until around nine or ten, owing to the generally anemic lung capacity of the average toddler. I have a feeling, though, that even if the flute had been a viable choice, my parents would have had me steer clear. Both of them had studied with my father’s father at the University of Wisconsin, so the flute had been a family affair. If being raised by professionals is a mixed blessing, it’s decidedly more mixed when those parents play your instrument. Picture the children of immigrants, who will always have a greater command over the new language than their parents do. Now imagine that those children are forbidden to speak anything but the old tongue at home. The musical mixes with the familial in strange ways. As a budding violinist, I had the luxury of assuming that my parents didn’t know anything about my new endeavor. By design or default, my mother was given the task of sitting in my Suzuki lessons and handling my daily practice. One day when Dad was assigned to me instead of Mom, I protested, “Mom knows how to read music. Do you?” Much later, when I was old enough to feel the weight of professional expectations, as well as the sting of parental criticism, I lashed out at my mother: “You don’t know about pitch because all you have to do is press the keys!” It was only after hearing hundreds of hours of flute lessons in our home that I realized it was, indeed, possible to play hideously out of tune on the instrument. So I have to consider myself lucky that I escaped the cycle of flute playing that had ensnared our family for two generations. According to my parents, their desire to keep me away from marching band steered me toward the violin. But I also heard about a brief period, during my father’s teen years, when his father attempted to be his teacher. Grandma put a stop to that, at least until it became clear that my father was going to play the flute no matter what his parents had to say about it. Then it was clear that his dad was the best teacher he was ever going to find. About my grandfather’s childhood I know relatively little, except that he was born in Erie, Pennsylvania, in the very western part of the state, near the coalfields that his forebears had worked. Thanks to Grandpa’s interest in genealogy, and his father’s careful preservation, we have wonderful paintings and even photographs of many of his ancestors going back generations. My favorite will always be a family portrait outside one of those humble clapboard houses fronting the coalfields. 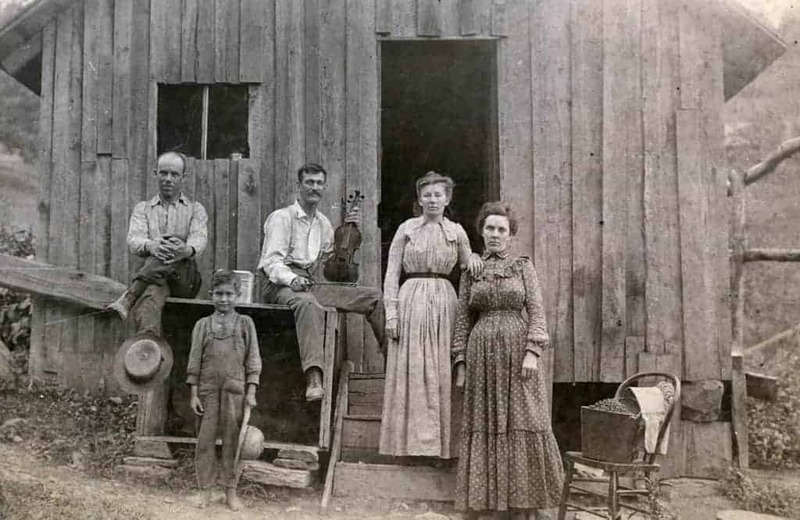 Grandpa’s father Harry is just a small boy standing in front, and his father, Emory, sits proudly above him, a tremendous mustache on his lip and a violin and bow in his hand. He was apparently the fiddler for local gatherings, and we have that violin still. The label reads “Straduarius”. Of course, the Depression hit when Grandpa was six years old. His tales of a single orange in his Christmas stocking, a far cry from the wrapped boxes spilling out from under my trees, still spoke of a middle-class life rather than one of true privation. But his harrowing stories about automobile travel—the narrow roads, spare inner tubes, hissing radiators, and complete lack of air conditioning—truly convinced me that he had endured a painful childhood! When I asked what kept him working at the flute, he told me that he wanted to know how much of the world he could see by playing music. So it must have been quite a journey from Erie to the Curtis Institute in Philadelphia, at a time when many men spent their whole lives within a fifty-mile radius of their birthplace. Grandpa’s excitement was short-lived, however, as the instrumental departments of Curtis were just about to shut down for the duration of the Second World War. Most of the male students (which is to say, most of the school) were entering the armed services, and he was eager to do his part. But when he went with the rest of the incoming boys for his medical exam, he was deemed physically unfit: at five feet five inches tall, he needed to weigh 115 pounds, and he was several pounds light. According to his pals, this was due entirely to his “chicken legs”, a trait that he would pass along to his sons. My father embarked on a comprehensive weight training program to combat this, but fortunately he married into a German family with well-developed thighs. Thus, ever since I was a toddler, I have never had a problem meeting any minimum weight requirements. I didn’t hear much about Grandpa’s Coast Guard service, just a few tales of monstrous waves and strange shores. I have no idea how, or even if, he attempted to keep up his flute playing, but it was definitely a secondary consideration. Winning the war and getting back to their sweethearts occupied most mens’ minds. When the war was over, Grandpa returned to his place at Curtis along with his mates. Shortly after, he married Doris. And in 1949, he graduated in the spring, welcomed my father to the world in the summer, and started his dream job in the fall. Grandpa’s years at Curtis prepared him specifically for a career with the Philadelphia Orchestra in a way that could only have existed at that time and place. 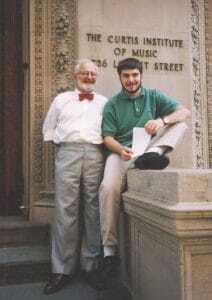 His teacher, William Kincaid, was the superstar principal flutist of the Orchestra. And Curtis lay only a few blocks from the Orchestra’s hall, where the students would line up each week to attend sold-out concerts. Group woodwind classes were conducted by Marcel Tabuteau, who had not only been principal oboe of the Orchestra for four decades, but who had modernized and systematized the instrument’s technique. The students’ weekly guest conductors were the same international stars that conducted down the street. And while the rest of the world could only marvel at the famous “Philadelphia Sound” through recordings, Grandpa and his schoolmates experienced, firsthand, just how it was created. Thus from a purely musical standpoint, Grandpa had an enormous advantage over any other flutist who wanted to join the Philadelphia Orchestra under music director Eugene Ormandy. His work habits, which he would keep up as long as he played (and would pass down to his children), sustained that advantage. But of course one crucial factor in his favor was the teacher-student connection that held so much sway two generations ago. 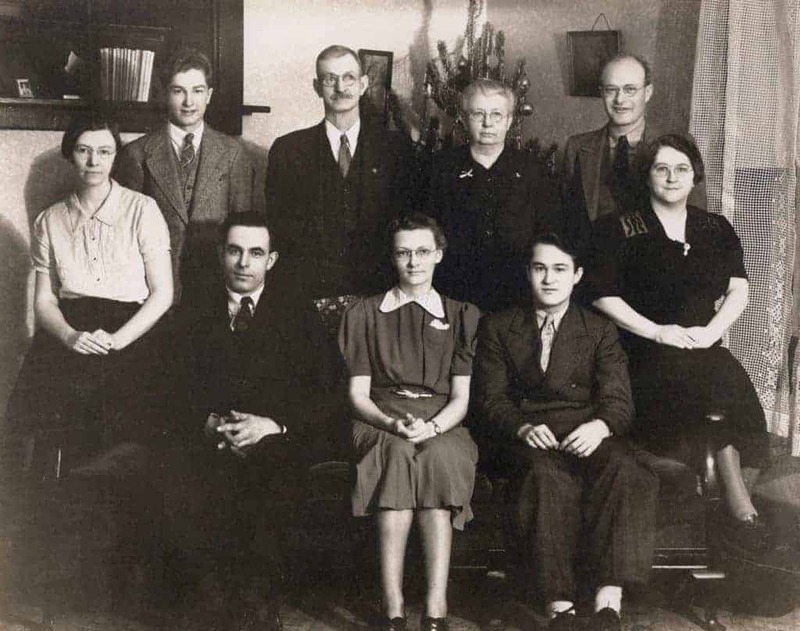 Thus when Grandpa joined the Philadelphia Orchestra in 1949, his teacher became his colleague. They were part of a worldwide sensation. The Fabulous Philadelphians, as they were known, had just become the first orchestra to appear on national television. Their recordings under Stokowski and Ormandy set the standard that Karajan hoped to surpass years later in Berlin. And no matter where in the world the orchestra traveled, they were treated like royalty. 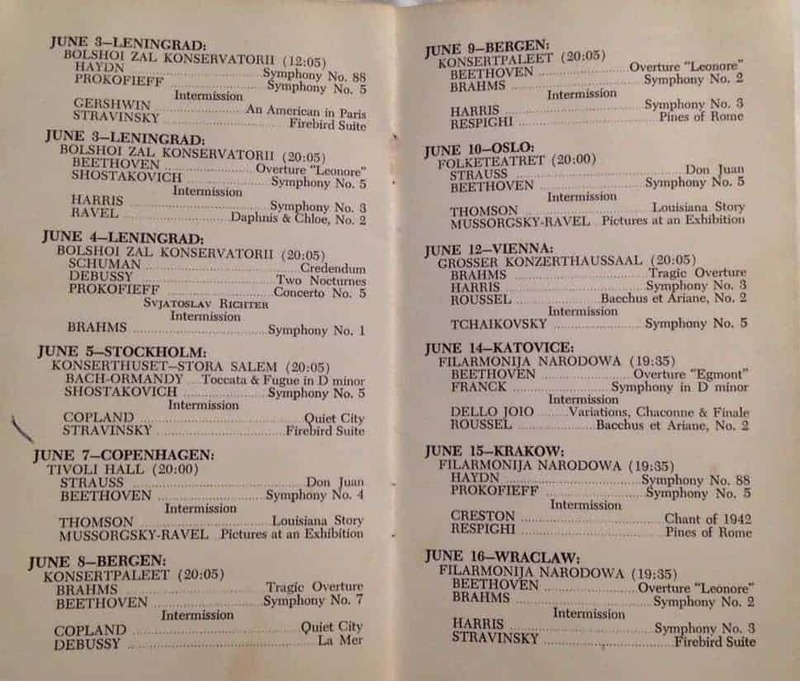 Grandpa even remembers Jean Sibelius welcoming the entire orchestra to his home in Finland in 1955. Perhaps it isn’t fair to compare orchestras between such different eras, but today, as symphonies search for ways to increase their relevance to their communities, they must often graft themselves onto other art forms. The Chicago Symphony plays The Lord of the Rings! It’s Back to the Future…live in the present! But when Grandpa joined the Philadelphia Orchestra, that relevance was built in. In 1940, Philadelphia under Stokowski was the other art form, as they collaborated with Walt Disney (and several dead composers!) to make Fantasia. When Philadelphia opened a concert with Rossini’s William Tell overture, the audience was hearing the theme song to one of the most popular shows on television, The Lone Ranger. And they would have recognized other themes in the concert from the Warner Brothers cartoon shorts that played in their local movie theaters. But if the Philadelphia Orchestra was musical royalty, they were still hired hands in terms of creature comforts on the road. In general, Grandpa’s descriptions of touring sounded like an extension of his Coast Guard days. He never got tired of contrasting my tours with his. He would hear about my one-week residencies or two-week jaunts, with the nice hotels and the chef’s tables, and he would just laugh. “Did I ever tell you about our eight-week tour of Europe?” I would smile, having heard about it many times. One day he dug up the actual schedule book from that 1958 tour, and gave it to me as a keepsake. “We played a different program every night!” A study of the book showed that he was right. They played more than fifty concerts on that tour, and every one was unique! To a modern orchestra administrator, this would be beyond unfathomable. How many rehearsals would it take to prepare more than one hundred pieces for a single tour? In Chicago and Los Angeles, we might tour for two weeks and bring but two programs. So how was it possible in 1958? There were several reasons. First, Philadelphia was in the midst of a remarkable run, one that will certainly never be approached: during a nearly seventy-year period, they had exactly two music directors. Stokowski reigned from 1912 until 1938, then Ormandy until 1980. These days, a music director is considered an institution if he or she lasts ten years! Second, traveling was exponentially more difficult in those days, even for wealthy conductors. Therefore a music director worked with his home orchestra much more than he would today. For example, Ormandy occasionally performed with the Philadelphia Orchestra more than 150 times in a single season! This allowed the orchestra to build up an enormous repertoire with him, along with a signature sound and interpretation. Extra tour preparation was unnecessary. Finally, although American musicians were beginning to flex their collective muscles, their “rights” could still be easily summarized in a compact agreement between each musician and the management. If Ormandy wanted you to learn a stack of music the size of the Yellow Pages, and leaf through it night after night, then that’s what you did. Otherwise you worked for the telephone company. Grandpa also told me about playing with Jack Benny, one of the titans of twentieth-century media, and a much better violinist than his long-running act suggested. Years before I came to play his Stradivarius, I heard about his charity appearance with the Philadelphia Orchestra. He began to play the Mendelssohn concerto (badly), only to be tapped on the shoulder by the concertmaster: “Excuse me, Mr. Benny, let me show you how to play it…” Benny’s sideways look of exasperation brought the expected applause. Then as he tried again, even worse than before, an usher jumped up on stage to say that he had heard the piece so many times, he would show Benny how to do it. Of course the “usher” was another violinist from the orchestra in disguise. Another signature turn to the crowd, another round of applause. Finally, after a third go, a “janitor” sweeping the aisles threw down his broom, leapt onto the stage, and angrily grabbed the violin from Benny. That brought the house down! 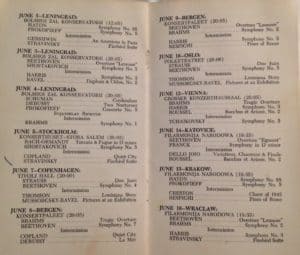 The complete list of conductors and soloists that Grandpa played with during his time in Philadelphia would simply be a roll call of the biggest names of the age. Some famous figures were loved by the orchestra, others loathed. Of the nearly two thousand concerts Grandpa gave as a member of the group, most receded into the far reaches of memory by the time I came along to ask about them. But some were unforgettable, and not always for musical reasons. He was on stage at Carnegie Hall in 1951 when the piano soloist Simon Barere suddenly collapsed during the Grieg concerto and died in the wings. In general, Grandpa shied away from describing those moments of artistic triumph that surely marked his years with such an elite group. Was it that the words to describe them eluded him, or that he felt they were unnecessary? I always felt that I could tell by a hesitation in his speech, or a faraway look in his eyes, when he was recalling a special time. I asked him about the violinists most of all. The summer after I turned fifteen, I fell in love with the recordings of Michael Rabin, who left a tragically incomplete legacy when he died at age thirty-five from a fall in his own home. 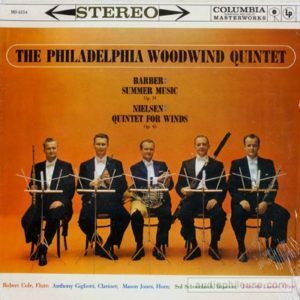 Grandpa saw the CDs lying next to my Sony Discman and told me about how Rabin used to stand back almost with the woodwinds when he soloed with Philadelphia. Oistrakh, Stern, Elman… even now, I can scarcely believe that my grandfather shared the stage with legends who exist to me now only as names and recordings. One of Grandpa’s favorite mementos from his days in Philadelphia was a book of caricatures by Alfred Bendiner entitled Music to My Eyes (1952). These pictures were originally drawn to accompany reviews of concerts by the Philadelphians, but as a collection complete with personal reminiscences by the artist, they provide a captivating look at the iconic figures of the time. Grandpa had the gumption to ask many of the subjects to sign his copy of the book, and I’m honored that he gave it to me when I started my professional career. Leafing through it, my first surprise was to discover a program tucked inside the front cover: it’s from 1953, and from this exact week: the last of December. 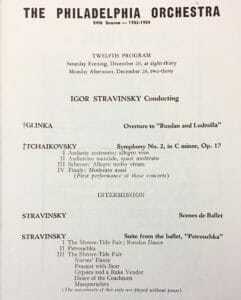 The Philadelphia Orchestra concert that week concluded with the suite from Petrouchka, conducted by none other than Igor Stravinsky! 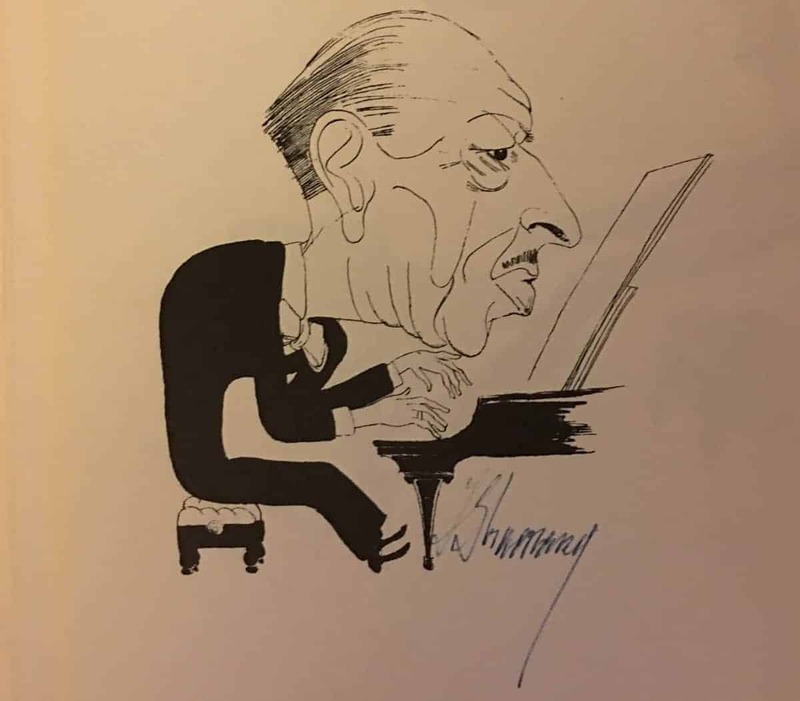 Grandpa must have approached him, as Stravinsky’s signature is crammed beside his caricature in Bendiner’s book. Just four Christmases before, when Grandpa first joined the orchestra, “Frosty the Snowman” became a sensation, while nobody sang “Rudolph the Red-Nosed Reindeer” because it hadn’t yet been written. But it had been forty years since Stravinsky set the world on fire with The Rite of Spring. Continuing on, I marveled at the signatures: Pierre Monteux is the only other “autographed” conductor, even though the space next to Ormandy (who Grandpa performed with more than a thousand times!) remains bare. Read into that what you will. Pianist Rudolf Serkin gamely signed and dated his likeness. 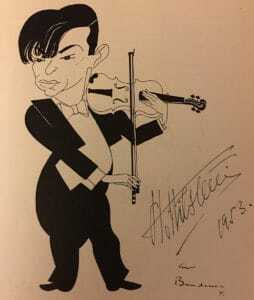 Most happily for me, violinist Nathan Milstein also donated a robust autograph. I’m often asked if I was named for that “other” Nathan, whose career lasted longer than that of almost any other violinist. According to my parents, our names have no connection. But I do find it remarkable that his beloved Stradivarius resides in Pasadena, California, not far from me. What a thrill it is to occasionally play that violin, knowing that Grandpa once performed with it (and its former mate), and shared at least a few brief moments of conversation! Yehudi Menuhin needed an entire page to fit his signature, while Mischa Elman must have held the book sideways since his name and date run from south to north. Zino Francescatti lent his autograph as well. 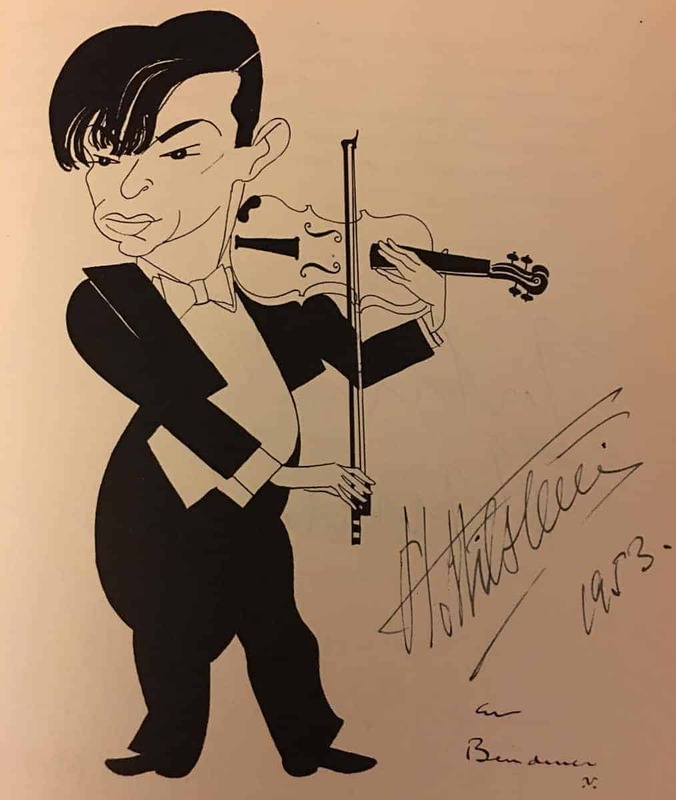 I’m embarrassed that for most of my teen years, I assumed that the incredible violin virtuoso was simply an editor at International Music Company, since his name (and unbeknownst to me, his bowings and fingerings) adorned so many of the solo pieces that I toiled over. Cellist Gregor Piatigorsky was the only one to sign specifically to Grandpa, writing, “To Bob Cole, With my very best wishes”. His mentor Kincaid didn’t even give a personal dedication! Only a neat and tidy autograph appears next to his dashing picture. Did he always consider himself the master, and my grandfather his pupil? I do know that there was great camaraderie within the section. Kincaid delighted in entertaining the rest of the woodwinds with an elaborate routine any time Ormandy (originally a violinist) would tinker with the strings’ bowings. To show how little difference he believed these changes actually made, Kincaid would take a single piece of cigarette paper and carefully place it under one leg of his chair. After testing the chair’s stability, he might take the paper away, move it under a different leg, or begin the charade all over again with another piece! For many years, that pride, and the tremendous rush that came from playing the greatest music with the greatest colleagues, had to take the place of financial compensation. No American orchestra was paid year-round during my grandfather’s time, and while the money was fine for a young man just out of school, it didn’t quite stretch to cover a growing family. My uncle followed shortly after my father, and my aunt not long after that. So, like most of the Philadelphians, Grandpa looked for other work when and where he could get it. He did some teaching, partly because he enjoyed it, but also because he needed to pay the bills! With Kincaid as principal, Grandpa’s time to shine was not onstage at the Academy in the biggest repertoire. So he took his chances elsewhere. Kincaid declined to play most summer concerts, then at a venue known as The Robin Hood Dell, so Grandpa played principal for those. He also excelled at the piccolo, proudly standing with the rest of the flute section during the piccolo chorus of Sousa’s Stars and Stripes. And he was asked to be soloist for a brand new concerto that paired him with the orchestra’s principal timpanist. I remember sitting with him in his retirement home as we listened to the live recording of that performance. I marveled at the guts it took to stand in front of a microphone in those days, knowing that editing was an expensive luxury reserved for the biggest names. But Grandpa’s greatest opportunity, and the way that most woodwind players know his name today, was as a member of the Philadelphia Woodwind Quintet. This quintet was made up of the five principals from the orchestra, but shortly after Grandpa’s hiring, Kincaid asked if he might like to take over some of the work with the group. Thus Grandpa found himself in the dream situation of making music on an intimate basis with four of the greatest woodwind players of that or any age: John deLancie (oboe), Anthony Gigliotti (clarinet), Sol Schoenbach (bassoon), and Mason Jones (horn). Among the group’s lasting contributions is a series of television programs entitled 200 Years of Woodwinds as well as several landmark recordings. One of these was an early recording of Summer Music by Samuel Barber. Any time I meet a woodwind player who asks about my last name, all I have to do is mention a certain bright orange record cover featuring a formally-clad quintet sitting in a straight line (for the love of God, why the music stands?). Then they know exactly who Robert Cole was! 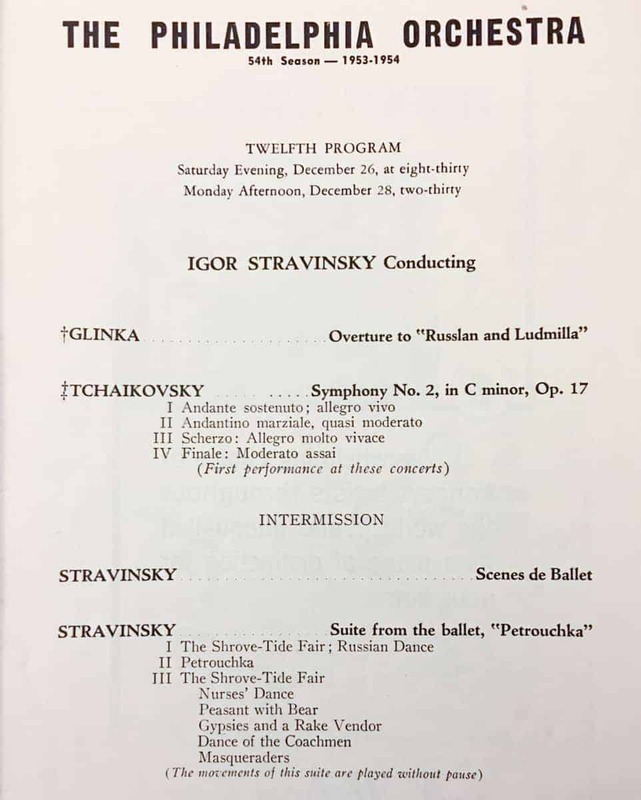 By the time the Philadelphia Orchestra was poised to become the first American orchestra to win a full 52-week season in the early 1960s, my father was thirteen and his younger siblings were not far behind. Those multi-week tours started to wear more and more on Grandma as she managed a full house alone. And for his part, Grandpa worried about the kids growing up on the city streets without his guidance. From a musical point of view, though he’d only been in the orchestra for thirteen years, he’d played the standard repertoire several times over. And in terms of workplace happiness, 1960 brought an unwelcome development: the departure of William Kincaid. This was still the era of mandatory retirement in the US, so once William Kincaid turned sixty-five, his days as a Fabulous Philadelphian were over. Grandpa struggled to find the same chemistry with a succession of guest principals and decided that the orchestral life, though it was gradually becoming more lucrative, was not for him. 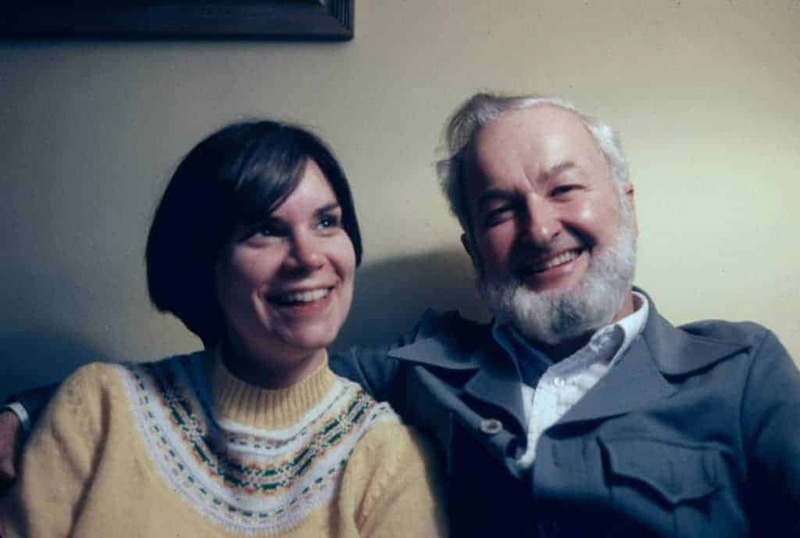 When the family moved to Madison, Wisconsin in 1962, the stage was set not only for the remainder of Grandpa’s professional career as a teacher, but for my parents’ eventual meeting. My mother, who grew up in nearby Janesville, first met my uncle John (who played horn) and soon after met my father and grandfather. 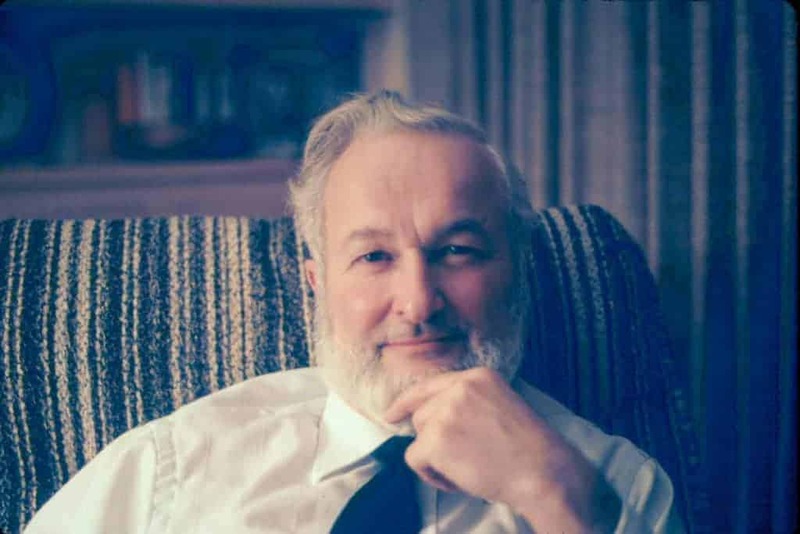 I heard fewer stories about Grandpa’s years teaching at UW-Madison, even though his time there was more than twice that in the Philadelphia Orchestra, eventually overlapping my childhood. I suspect that his family assumed greater importance once they made the move to Wisconsin, and that the cast of characters at the University was both smaller and less audacious (one notable exception was the new symphony conductor, Otto-Werner Mueller, who would later be my conductor at Curtis). But the students whose lives he touched have told me that he made a far greater impact in Madison than he ever could have in Philadelphia. My mother remembers him as a kind, patient, but exacting teacher before she knew him as father-in-law. 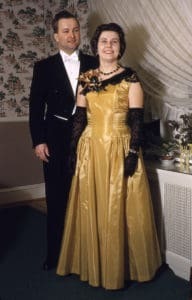 And one of his last students was Catherine Karoly, who performs with my wife and me every week as Assistant Principal of the Los Angeles Philharmonic. Grandpa kept playing in Madison, taking his place in an unusually strong faculty woodwind quintet. Richard Lottridge, former member of the Chicago Symphony, was the bassoonist. John Barrows, who gave Sam Barber the ill-used woodwind tuning charts, took the horn part. Harry Peters was the oboist, and according to students of the day, the group was known informally as “Four Guys with Harry Peters”. 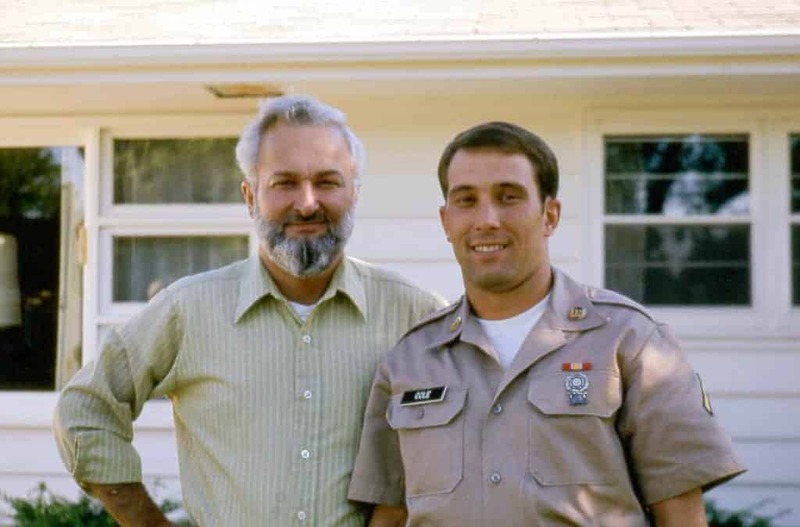 My father began teaching at the University of Kentucky in Lexington in 1976 (after a term in the Army Field Band), so that his teaching career and his father’s coincided for twelve years. As Grandpa’s retirement neared, at age sixty-five, I was about to turn ten. It was becoming more and more likely that I would stick with the violin for the long haul, so his students, including Cathy Karoly, were forced to endure monthly updates (not to mention photographs) of my musical exploits. I have a distinct memory of Grandpa’s retirement party in 1988. It’s stuffy, even itchy: that feeling a ten-year-old gets when he’s surrounded by adults he doesn’t know, but who know of him. I was set to perform a short piece whose melody escapes me now. But as a prelude, the lights dimmed and the entire gathering watched a slide show emceed by one of Grandpa’s soon-to-be-ex-colleagues. It was part roast, part This is Your Life, and there was some salty language, which delighted me. As I began to enjoy myself, I thought, people really like being around Grandpa! I wasn’t shocked, but I’d simply never thought about it. In fact, back in 1973, Grandpa had been one of the founding members of the National Flute Association, and its president five years later. Had I seen him at the annual conventions, my parents tell me, I would have understood how important he was to the American flute community. I’ve often noticed how much more connected flutists seem to be, compared to string players (with the notable exception of double bassists). Surely the NFA, its competitions, and its publications deserve much of the credit. I saw my dad’s parents once or twice a year growing up: always in the summer, and sometimes during the Christmas holiday as well. The summer visits were invariably longer. We might spend time at their home in Madison, or at the farm they eventually bought just a mile down the road from their daughter’s farm. Or we might live at their lake cottage for a week, a stone’s throw from a similar one owned by Richard Lottridge, his old quintet-mate. Both my grandparents’ knowledge of the outdoors, of hunting, fishing, farming, and navigating, never ceased to amaze be. 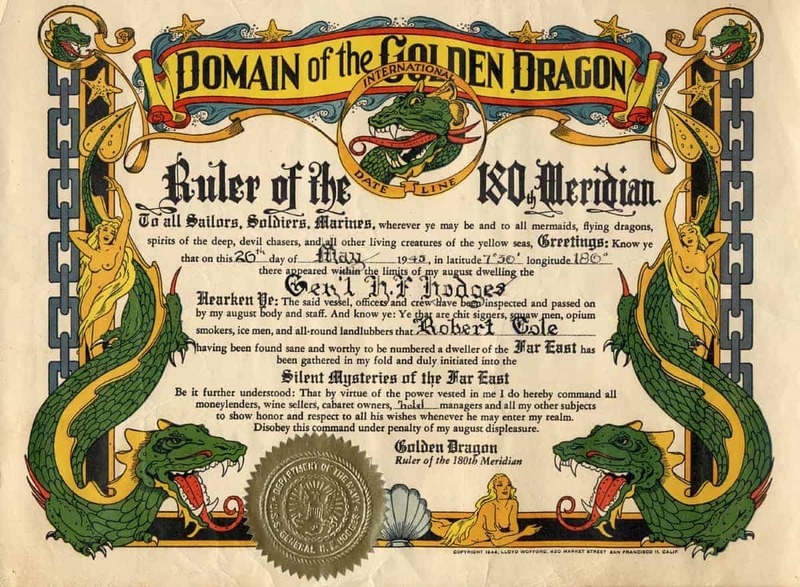 My father seemed to know about all these things as well, but it was only in a rural setting, and in his parents’ company, that I fully appreciated it. I performed with my parents seldom enough during their playing days, and my grandfather even less. But as a Suzuki student, I did spend my first several years learning the violin under the watchful eye (and flute) of my mother, whose faultless intonation I hoped to blend with during our daily practice sessions. And when the weak spot of Suzuki training (note reading) couldn’t be papered over any longer, I began sight-reading training with both of my parents. I would have been about eight years old. To put it plainly, I hated everything about reading music. I had finally reached a level of comfort with the instrument such that I could play anything I heard with ease. Now, with a page of notes in front of me, I was reduced to a beginner’s level all over again! Sight-reading practice meant playing flute duets with one or the other of my parents, with the requirement that I could not stop no matter what happened. It was torture having to listen to myself play badly, and to be told that it had to continue until the page was over. One of our visits to the lake cottage must have coincided with this unhappy period, since I have a clear memory of playing not duets, but flute quartets (by the indomitable Friedrich Kuhlau) with both my parents plus Grandpa. Now I had six eyes trained on me, making sure that I kept my place in this batter of semi-sweet harmonies. When my parents had decided that I’d had enough (or, more likely, when I had whined one too many times), the session was over. Grandpa began to reminisce about a more pleasant Kuhlau experience. While my parents were still studying at Madison, the great Jean-Pierre Rampal had come to give a master class and a recital. 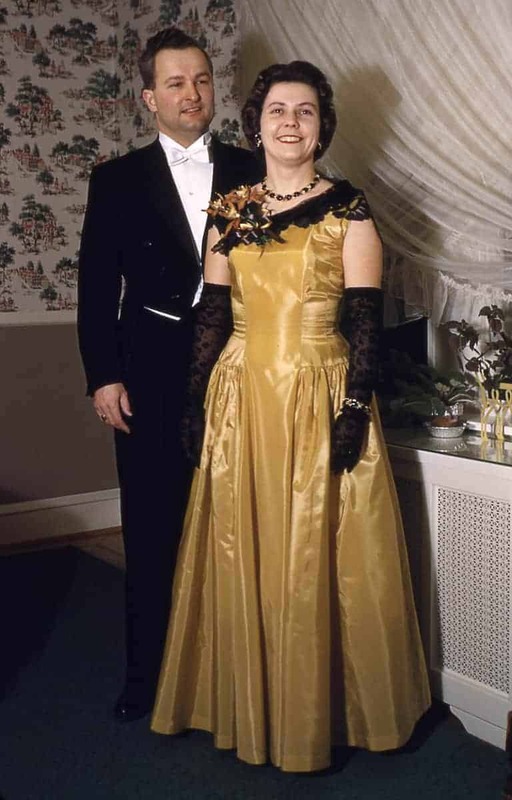 After the program, he had gone to the Cole residence for dinner: very late for the Coles, l’heure juste for a Frenchman. “Like Itzhak Perlman coming to our house,” my father said. Rampal apparently liked to talk, and drink, and eat, and when he’d had his fill of those, he liked to play the flute. So as the clock struck midnight, my parents, Grandpa, and the greatest flutist in the world unearthed the Kuhlau books. I believe they kept the wine going as well. I wonder if anyone walked by the house that night, pausing to look in at the one lighted room on the block, hearing faint laughter mingling with four intertwining voices? I went to Curtis about fifty years after Grandpa, and he helped me find my apartment in Philadelphia. Sol Schoenbach still lived nearby, and he knew a guy, and that guy had a son, and he owned a bunch of buildings. My one-bedroom was $480 a month, which must have been more than my parents’ mortgage. It turns out that my Grandpa had lived less than two blocks away! “Is that Chinese laundry still on the corner?” Grandpa asked. I suppressed an eye roll, then remembered that indeed there was a dry cleaners at the spot he had named. There was a sandwich place too, though not the one he remembered, and certainly not as good. “Be careful in Rittenhouse Square!” he warned. Apparently, Grandpa’s small-town habit of whistling as he walked had attracted the attention of older men who gathered in the small park that sat across 18th Street from Curtis. I promised I wouldn’t do the same. As the years passed, and I began accumulating my own trove of orchestra tales, I vowed to ask more specific questions about Grandpa’s career. But I was too timid; I never wanted our conversations to feel like interviews. I shouldn’t have been concerned. He was a lively storyteller, and he had so much material to work with that he could have gone on for hours without circling back. I assumed there would always be time later on. Grandma died nearly ten years ago, after living with Parkinson’s for long enough. She kept her sense of humor until the end, and I knew that he would as well. Each of them harbored a competitive streak, individually and between them, and some of the funniest stories had that edge. Each summer at the lake, my parents would point out a certain spot on the asphalt lane leading to my grandparents’ cottage. A blob of yellow plastic appeared to have sunk into the crevices there. But it was apparently no passive melting: one evening Grandpa, after one too many unlucky rolls of the dice versus the Lottridges, had grabbed a hammer along with the dice, and run out of the cottage. The visiting couple, peering through the dusky doorway, could just make out a figure bent over the road, hammer furiously pounding, the sounds reaching them a split second later. Then there was the infamous coffee war over the course of one week at their farmhouse. For quite some time, Grandpa had made his preference for stronger coffee known. Grandma had spoken out for a more moderate brew. As the years went by, slight preferences became concrete desires, which became dogma. The morning coffee duty fell to whoever got downstairs first upon waking, so during that fateful week, reveille became a race for the coffee pot. Day by day they managed to alternate, each decrying the other’s swill. Finally, upon having to consume one of Grandpa’s bitter cups, Grandma declared that he had finally done it: he had brewed something totally undrinkable. He countered that it was his favorite coffee yet. The war ended later that day, when Grandma cleaned the machine and found that in Grandpa’s haste, he had managed to run part of the power cord through the brewing basket. His favorite pot had been thirty percent melted plastic. The two of them traveled widely. Grandpa had seen the world twice: once in the Coast Guard, and again with the orchestra, but neither time on his schedule or with the woman he loved. So they made the most of their golden years, touring China in the mid-1980s (when it was practically a different country from today), Alaska by cruise ship, and the rest of the United States in their RV. Grandpa took pictures wherever they went, and his slideshows (with actual slides) upon their return undoubtedly inspired the computer slideshows I inflict on all my friends to this day. 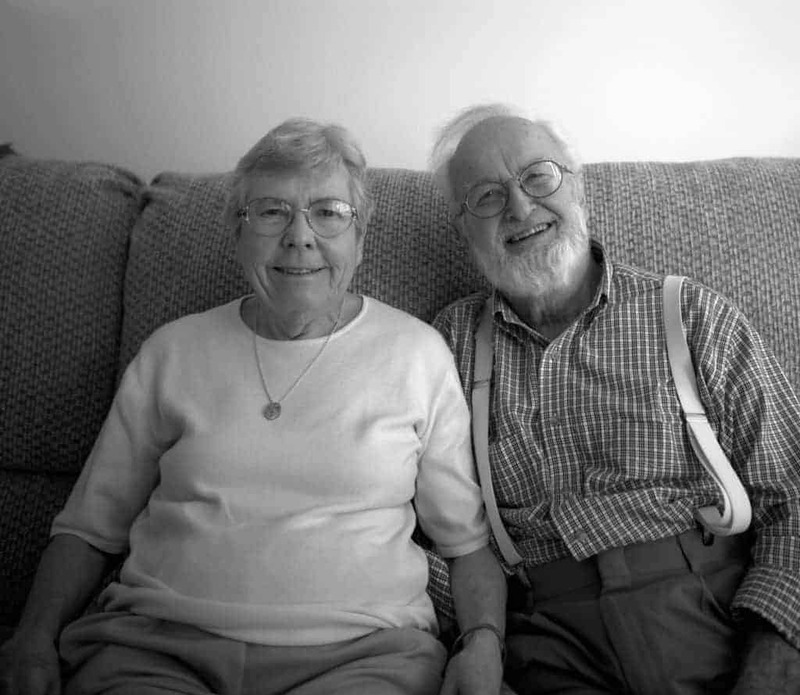 The last portrait I took of Grandma and Grandpa together was at their apartment in Madison in 2002, while I was in the midst of a major photography kick. My father had given me my first camera when I was eight, and he must have gotten the bug from Grandpa. At this point, my weapon of choice was a 4×5 cherry-wood field camera, with a bellows and a dark cloth: I only needed a twirly mustache to resemble the photographers who had taken his ancestors’ portraits in the mid-1800s. Grandma and Grandpa sat patiently while I painstakingly prepared the film and camera. My log tells me that I exposed the 4×5-inch sheet of Kodak TMAX film for a full half-second at f/8. I can’t remember if I let them know to be extra still because of the long exposure, but their serene expressions, combined with a slight distortion from my wide-angle lens, always arrests my attention. Grandpa continued traveling solo until he was ninety years old, and one of his annual stops during his last decade was my hometown of Lexington. He came at the end of each August to see Akiko and me play at the chamber music festival we started there. During one of his last visits to Lexington, I got word from a friend that Jerome Wigler was about to retire from the Philadelphia Orchestra. I mentioned this to Grandpa. I said that I didn’t know about that, but that Wigler had joined the Orchestra in 1951, just two years after Grandpa. I granted him that jibe. Menuhin and Milstein had gone on playing concerts into their eighties, and the same can’t be said for many flute players. The flute, after all, requires the literal breath of life, and that never lasts as long as we wish. But Grandpa always seemed to know when it was time to move on. May we all share the time we have left with those we love. Nathan, so sorry for your loss. Thank you for sharing all the great stories. They reminded me of similar stories I’ve heard about “Uncle Jimmy,” my wife’s uncle. James Chambers also attended Curtis, and played in Philadelphia Orchestra (likely at the same time your grandfather did) and finally ended up playing principle horn with NY Phil for many years. Things have changed so much since those days! So sorry for your loss. It appears that your generosity and expertise in helping so many of us has its roots in your Grandfather. Thank You for the wonderful story of him and your family. Again, my condolences at this sad time for you. Thanks for writing and posting this wonderful tribute to your grandfather. He was a fine flutist and teacher. I always enjoyed talking with him at the annual meetings of the National Flute Association. He always seemed to have a twinkle in his year and was a good fellow to be around. Your story fills in a lot of gaps in his life that I knew nothing about and makes me feel privileged to know him. I’m sorry for your loss. I read through the whole post about his life, and it’s wonderful. I am sure he was lucky and happy to have a grand-child who respected and admired him as you did. What a wonderful tribute to your grandfather. You have a gift for story telling and writing, for this story about your grandfather and your ancestry was captivating to read. I loved the story of your grandpa and his wonderful life. You have been truly Blessed by your family and your heartfelt writing gave me the feeling of “knowing” him and the process that has produced YOU, a kind, giving, wonderful player and a great and patient teacher. Having a granddad such as yours in our world is like throwing a rock into a quiet pond. As the ripples spread out, the essence and experience of the life lived fan out and touch everyone and everything in the Universe. In his case, as yours, it makes the world a better place. Thank you for sharing your grandpa’s story. It was touching and dear and I loved reading it. I’m so glad my niece Elise Wagner sent me this. I was never more thrilled than when I learned that Mr. Cole–I just can’t call him Bob–would accept me as a student when I was still in high school. My mother used to drive me in to Madison for lessons at his home, and by then he had what she called his beautiful chinchilla beard. Your great grandmother was living there, too, and your grandmother Doris was like a second mother to me and I’m sure all his students. I attended Juilliard as a Baker student, and James Chambers (who taught the wind orchestra rep class) expressed great fondness and admiration for your grandfather. I know he couldn’t have been more proud of your success. I knew your Uncle John and am very sad to learn of his death. Glad to know, however that your grandfather died in his sleep. Quite the legacy there like the family Bach. No wonder u are the great musician u r. To be blessed with all that family artistry was an amazing advanrage you had that most aspiring musicians did not or don’t Belated condolences re your grandfathers passing. My son is a gifted classical guitarist. I am somewhat happy. Or relieved he chose another voice for. his artistic path. Nathan, so sorry to hear about your grandfather, and my condolences to you and your family. Thanks so much for sharing a bit of his life and yours. What wonderful stories of a life well lived! Thank you all so much for reading and for your comments. I’m overwhelmed not only by those of you who knew Grandpa, but who came to know him through his stories here. Let’s take advantage of our time in 2017! This touched my heart and greatly honored your grandpa as well as your parents. Thanks for sharing this. Blessings to you, Akiko and your babes. Mr. Cole….I so enjoyed reading about your grandfather. As a flutist, and the spouse of a flutist, up here in the San Francisco Symphony, I have heard of your grandfather for many years. I sent you a message last year, when my mother told me that your grandparents and your parents had camped on my grandparents’ property, invited, of course, at “The Woods” in York, PA. My gramp had played with your gramp in the York Symphony, when YOUR grandfather was a Curtis student, and my Gramp was an older founding member of the York Symphony. Small world, indeed. Again, I enjoyed your writing, and continue to enjoy the music of your grandfather, as we have the orange album, with that damned difficult Summer Music on it! Thanks for this story! I remember when you emailed me years ago, and I passed it along to Grandpa while he was still with us. He loved remembering those times. My condolences to you and your family. Beautiful story! I’m so sorry for your loss. Your story was full of warmth and wonderful family anecdotes. Your grandfather was a musician of enormous talent and yet his wit and of sense humor was priceless. A remarkable life and a remarkable man. I’m so very sorry for your loss. What a beautiful and edifying tribute you have written to this incredible man! It was such a great pleasure to read. Thank you! Great to read nice content……. What a wonderful tribute to your grandfather – so much we didn’t know about the person who meant a great deal to us. I studied with him in the early 70s and performed with him in Wisconsin several times. He always emphasized the music rather than the technique. I’m grateful to you for sharing much of his life and to him for sharing his talents. 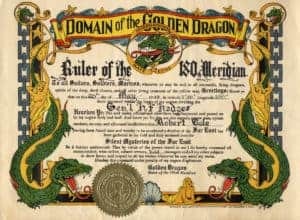 Thank you for sharing your connection to my Grandpa! I’m happy to hear about his teaching from you. Thank you for memorializing your grandfather in such an eloquent and public way. I am a flutist myself, a college student, and upon listening to his recording of Summer Music with the Philly Quintet I googled his name to find out more about the flutist that I originally assumed would have been Kincaid. It is wonderful to really learn about a musician through such a personal lens rather than just a dry biography. He sounds like a great grandfather and person, and as a musician I respect him as a marvelous flutist! Thank you. I really appreciate the kind words! Of course, thanks for writing! I’ve sent you an email.